Two cam lock screw types are located on the top rear of the nose cowling. One partially broke. Need part number and where to purchase please. It is the type that need a 90 degree turn to lock. I think the part number is 460-045. It's a quarter turn fastener that has a slot for a flat head screwdriver and the edges are made so it can be turned by hand also. 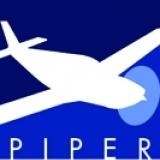 Muncie Aviation in Indiana sells a lot of Piper parts and there is one on eBay right now too, I think the price on it is 36.41 plus shipping.